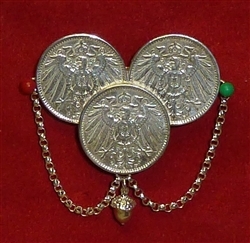 Custom Tie Holders can also be made to fit your specific German, Austrian, Maria Theresa Thaler and Commerative Fest coins. Men's Tie Holder in .925 Sterling Silver with Rolo Chain and Acorn. Can also be configured with a pin for knit ties at no charge. 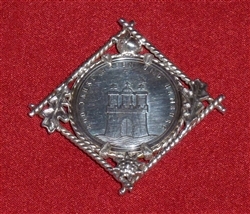 Men's Custom Tie Holder in .925 Sterling Silver. Price dependent of Coin and trim.